PENN may be most beautiful four letter word in the Track & Field dictionary but my senior year in HS as I rounded the final turn and hit the home straight-away of the Championship of America DMR I had a number of uglier four letter words going through my head. I was in the lead, barely, with 100m to go. I finished 4th.I got ripped. Shredded. Torn up. Woop-wooped at Penn. It was ugly. And it was also crushing, heartbreaking, devastating, cataclysmic, brutal, mean, lonely and not funny in the least – to me. I lost. I was beaten – not once or twice but three times in the final straight at Franklin Field. It was the single most important race I had ever run up to that point in my career. Looking back, it may still be the most important race I ever ran. It’s surely the one race I think about more than any of the others. Penn is a scar. But, Penn is more than that race or any one race. It is so much more. Penn is a Fair. We’re in the midst of the carnival that is the Penn Relays right now. Yesterday the ladies took center stage with the College DMR and HS Girls Mile and 3K and DMR Championships. Last night, Franklin Field was taken over by distance running fanatics. Distance Night is race after race of, you guessed it, distance running. 5k’s and 10k’s and steeplechases. It’s awesome, especially if you are a running-nerd and the crowd is almost entirely running nerds. Penn is Home. If you love this sport and spend time with it and support it and take part in it then when you go to Penn you will spend large parts of your time bumping into people you know. It’s crazy how you can walk around a stadium of 50,000 people and constantly have to stop and shake hands with someone or hug someone else. Track & Field is a small and tight knit community and within that community are a number of families. Penn is like a reunion or homecoming or Thanksgiving. It’s a joy to see old friends at Penn and a gift to be able to head to Philly every year and leave with a few new friends because of the Relays. Penn is the Race. Every race, and there are 100’s, is the race while it has the track. It does not matter if it is the College Mens Championship of America 4×800 or heat #44 of the HS Girls 4×100 – if it is a good race the crowd, all of it, will acknowledge. The backstretch will stand if a 15 year old is making a big move on the homestretch and the homestretch will stand if there is a battle on the backstretch. The crowd will erupt with woop-woops if someone is getting walked down (know this firsthand). It is hour after hour of racing which is perfect because the crowd came for racing. Penn is Food. Luckily, I’ve never had a problem with celebrating a beautiful and healthy exercise while gorging on seasoned trash. The Food at Penn is standard sporting event fare – $9 chicken fingers and french fry baskets or $7.50 cheeseburgers. You can get some Jamaican food if you’d like. I steer clear of that. It’s a question of patriotism really. I feel it is my duty to eat incredibly unhealthy American food while I scream, mouth full, U-S-A as the Yanks rock the Island interlopers. If I need to eat very poorly for 72 hours so our sprinters can handle Jamaica at Penn then dammit I will do it. I got a little off topic here. Sorry. I’ll end the food portion here with some simple advice. At some point over the meet leave Franklin Field and get a Cheesesteak. If you don’t people literally yell at you. Penn is Fear. Stepping onto the track is overwhelming then terrifying then invigorating then terrifying again. If you are a college or HS athlete Penn is most likely the biggest and most exciting stage you will ever perform on. The 1% of the 1% will get to run at Pre and in Europe and at Trials. Everyone else, if they are lucky, get Penn. For so many it is their Olympics and World Championships and Super Bowl and Prom and Broadway debut rolled into one. It’s their chance to feel elite. With all of that comes fear and terror. You can see it on the young runners faces as they take the track. Good. Everyone should experience that panic. What I love is that I have never seen someone walk off the track before they race. They all overcome that fear. They race. Badass. Penn is Pain. It hurts more at Penn. Probably because you want it more. The effort, the wind, the cold, the heat, the loss – they all are more. Maybe it’s because your senses are aware of everything. And because of that the pain is greater – more real. The elbows are pointier, the spikes are sharper, the pace is more severe, the sprints are faster, the long drives are…longer. Penn just takes more. And when it takes from you, well, it’s painful. But it’s worth it. Penn is the Wall. “Face the Wall”. You will hear those instructions as you wait in the paddock. Those words mean it is almost time. Soon, you will be on the oval. You will be center stage. Close to 50,000 rabid track junkies will be watching. What they want is competition. They will cheer success and failure all the same. Are you ready? Of course you are! You are already walking to the wall. Penn is Penn. There is no other meet like it. There are no fans like the ones at Penn. Sorry Europe. Penn is just, well, a really powerful four letter word. Yes, when I think about Penn I have a number of four letter words – fu$*, $hi^, etc., that I remember rolled through my head and heart and soul back in 1994. But, I also have those other four letter words though too – Scar, Fair, Home, Race, Food, Fear, Pain, and Wall. They mean Penn too. But mostly, I have a five letter and three letter word that I hear over and over again when it comes time for The Penn Relays. My wife and I have three kids – ages 11, 9, and a soon to be 7. We’ll all be up early Monday. Patriot’s Day. The day of the Boston Marathon. It will be a celebration in our house. It will be a day of remembrance in our home. We will wake and we will watch 36,000 take the line on Main Street in Hopkington. We’ll hear the starting gun announce a brand new beginning. We’ll watch as these people, these athletes, these marathoners,these brave souls travel so much further than the designated race length of 26.2 miles. My wife and I have watched the Boston Marathon before. Our kids though, this will be their first Boston. They need to watch this race. They need to cheer and shout and roar for Shalane Flanagan (a fellow Tar Heel). They need to hear my wife and I talk to about the effort and sacrifice that the elite runners give in order to devastate their bodies over 2 plus hours of asphalt hills. We need to tell our children that years of discipline got these incredible runners to the starting line for this one day. This one shot. They need to see the marathoners barely hold on mile after mile until suddenly, like an epiphany, they realize the well is not dry. They need to see the push, the drive from miles away from the finish. They need to see the risk some of these runners will take with no guarantee of reward. They need to see people not back down from the possibility of failure. We need them to see people come up short. We need to tell them that over 26.2 miles so much can go wrong. They need to see the anguish on the elite runners faces when that calf cramps at mile 14 and the dream is at best put on hold or at worst over. They need to see when the quads fail at mile 23 and the laurel wreath quite literally runs away. Our kids need to see things go wrong. They need to see what happens. They need to see how people respond to pain and sadness. They need to see that sometimes people fail. They need to see fire blaze within the marathoners as a million wild Bostonians lining the course inspire the runners as they are inspired by the runners themselves. My kids need to see people cheer wildly for a stranger, cheer as the stranger struggles, cheer because the stranger keeps going, cheer because the stranger could quit – but does not. My kids need to see people who start the race not as runners but over the miles become runners. Become athletes. Become something new. Become reborn. Become better. They need to see that people can change – if they want to. If they are willing. They need to see how words can lift spirits, can lift people. My kids need to see the young women from Wellesley College who come out every year and make sure every last runner feels like they are winning the Boston Marathon and maybe get to snag a kiss. We will watch because my kids need to see how beautiful it is to move. They need to see the joy that breathing because of effort instead of instinct brings. They need to see that competition is good whether it is against another or the clock or against yourself. They need to see people of all shapes and sizes and colors who speak different languages and worship different Gods and vote for different candidates and root for different teams unite in something that needs no words to explain and all Gods can agree is worthy. They need to be reminded that last year something terrible happened. They need to to hear the stories and see the memorials and listen to the testimony. They need to know that sometimes people get scared, even their parents. They need to know that evil exists. They need to know that there are more people out there that fight against evil than for it. They need to know that courage is out there. They need to watch the recovery and rehabilitation of a city and its people. They need to hear about One Fund Boston. They need to know that Shalane Flanagan was the first one to sign up for this years race and that to us, their parents, it means more that she was the first to the starting line then if she is the first to the finish line. They need to know that some of our friends are racing. They need to know that some of the Police and Firemen and EMT’s and Doctor’s and Nurses that saved so many lives and protected so many people last year will be running. They need to know that some of those that were hurt so badly last year are running. They need to see bravery. This will be the 118th Boston Marathon. My kids will watch this one because they need to. I can remember it clearly. I was eight years old. It was Summertime. 1984. I remember the excitement I had as I watched the opening ceremonies of the Olympics. They were in Los Angeles. A guy literally flew into the Coliseum on a jetpack. Still the coolest thing I have ever seen in an opening ceremony. The thousands of Chinese Drummers drumming in perfect unison from 2008 were the scariest. Buck Rogers Jetpack Guy = cool. Chinese Robot Drummers = Scary. I remember the parade of athletes walking into the sun drenched and sold out LA Coliseum. I even remember my older brother Bobby kneeling down close to the television pointing to this athlete and that athlete, telling me about this great feat and that great performance and this one’s potential and that one’s past glories; trying to get me to understand that this was no ordinary collection of athletes. These were Olympians. He only paused twice, for two specific athletes. He would take his eyes off the TV briefly and let me know that over the next few weeks I needed to pay special attention to these two. They were , in his mind, the extraordinary amongst the extraordinary. One was a young basketball player – a Tar Heel named Michael Jordan. The best college basketball player in the world. At least according to my brother Bobby. Jordan was going to take the world of basketball to school in LA. I listened. I had never heard of the guy. I quickly forgot about MJ until a Nike commercial a few years later. My older brother’s other athlete of special distinction was a guy by the name of Sebastian Coe. He was British. He sounded British. He looked British. He was small too. But he was the best runner on the planet. I had heard of this guy. Thanks to Wide World of Sports on ABC every weekend I had seen him race a few times. I really had no idea how good he was though. But an older brother’s words are gospel truth. So, as far as I was concerned, from the moment my brother Bobby uttered it, Seb Coe was the man to beat on the track. Over the next two weeks I was either watching the Olympics or I was outside pretending I was in the Olympics. The day would often start with me running along the perimeter of my backyard mimicking Carl Lewis and his straight hands while he sprinted down a long jump runway or channeling Edwin Moses as I jumped the bushes lap after lap around my house. When I was in the swimming pool that Summer of ’84 I was Rowdy Gaines or Pablo Morales. I was a horrendous swimmer. Still am. But. in my mind I was world class when I was in the water that Summer. Baseball (played with a tennis ball to protect the windows) would find me morphing into my Team USA Baseball (former) idol Mark McGwire. He and I were both much smaller then. Over the years I got bigger simply by I growing up. He took steroids. I digress. Turns out I did not need to use tennis balls. Nothing I hit would have broken anything. I L-O-V-E-D the Olympics. I could not get enough of it all. I had a USA Track shirt (probably from a Marshall’s sale rack) that I wore just about every day. It had to have been filthy. Little kids are adorable when they are filthy though, right? Man, I hope so. Because I had to have been a little ball of dirt and sweat for those couple of weeks. I’m sure that Bobby tried to explain the backstory to Coe’s ’84 Olympics as best as he could to an 8 year old. As I am sure YOU already know Coe was the overwhelming favorite to win the Gold Medal 4 years earlier in 1980 in the 800m at the Summer Games in Moscow. Coe was the World Record Holder. He had not lost an 800m race in years. He lost to his great arch-rival Steve Ovett of Great Britain in one of the classic upsets in Olympic history. Coe ran horrendously. He made just about every tactical mistake one could make in a race. At the finish line in a stadium of 90,000 he stood confused, shocked and devastated. Alone. The British press was not kind to Coe. One newspaper had a picture of Coe warming down after the 800 under the headline “Trail of Shame”. Those English may have great manners at tea time but they can sure be brutal after all the biscuits are done can’t they? When it came time for the 1500m final a few days later no one gave Coe much of a chance. For one, he was not the favorite as he had been in the 800m. 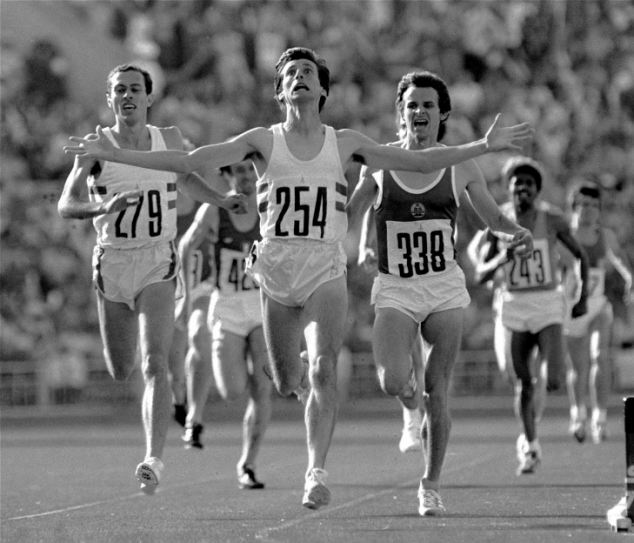 The 1980 Olympic 1500m favorite was none other than Steve Ovett. Yup, the guy who upset Seb in the 800m. What Seb was to the 800m Ovett was to the 1500m – a man amongst boys. Ovett had not lost a 1500m in 3 years – 45 straight wins and Ovett had recently set the WR’s in both the 1500 and the Mile. But, they don’t hand the medals out before the race do they? Nor do they award the medals to the runners that the press choose. The second great upset of the Games in only a few days in Moscow. Redemption? Revenge? I don’t think so. He’ll never get that opportunity for 800m Gold back. I believe he won because he still believed. No one else did. No one else needed to. At the end of the 1980 Olympic Games, Coe had the WR in the 800, and a Gold medal in the 1500m and a Silver in the 800m. He was young. He was strong. And 1981 would be his greatest year on the track. He looked primed to dominate straight through the LA Games. Three years is a long time though and when the 1984 Olympics 1500m came around the great Seb Coe found himself in a familiar position – being doubted. Track & Field is a game of what-have-you-done-for-me-lately and Seb had not done much in 1984 or 1983 for that matter. The British Athletics powers-that-be felt that Seb was not fit enough to take a spot on their squad. They had a valid point. Seb had come down with a parasitic disease called toxoplasmosis in ’83 and had shown signs that his battle with the debilitating sickness was not over. He ran at the very best poorly in the lead up to the LA Games. Controversy fueled by the British papers erupted. When he was named to the Olympic team the press seriously questioned the move. Some in the British press were quite obnoxious in their ‘journalistic’ opinions. I knew almost none of this as I watched Seb take the line in the 1500m. I just knew that some people did not want him on the team because they thought he was old and sick and weak and past his prime. Some people believed that Seb was arrogant for even believing he belonged at the Games much less believing he had a chance to medal in 2 events like he did in 1980. Seb started the LA Games by winning both his heats of the 800m before running into the Brazilian 800m titan Joaquim Cruz. Seb scored a second Silver in the 800m to go with the one he won in 1980. It was considered a great performance by Coe. Many believed that whatever magic he could summon during these Olympics must surely be spent. Seb had already raced three times. He was not the same runner that dominated middle distance running in 1979 or 1980 or 1981. Next, would be the 1500m. Even History seemed to be against him. No man had won two successive Olympic Gold medals in the 1500m. I remember watching the race in my family room. I sat on my knees on the floor. Over the course of the week I started to know some of the milers. So I knew it was Steve Scott, the great American miler, taking the pace early, too early, probably giving the sold out LA Coliseum crowd what they wanted but not what his coach wanted. Scott faded after halfway. With 1 lap to go the Spaniard Jose Manual Abascal led with three Brits on his heels – Seb Coe, young Steve Cram and Steve Ovett. I vaguely remember the line of them as they hit the first turn of the last lap. Abascal wore red and blue and the Brits each had white shorts and white singlets. I remember I was nervous. I didn’t need to be. Coe blasted the field from 220m out. He pushed again at 120m and yet again with 80m to go. Three moves at the end of an Olympic Record 1500. Amazing. There would be no one waiting for him at the finish at the end of this race. He would cross first and as the first to ever win the 1500m twice in a row at the Olympics. I know the race inside and out now. I have watched it dozens of times. If I really try to remember what it was like watching in 1984 and what I actually saw as an 8 year old it gets hazy…except for one moment that remains crystal clear. Coe finished the race. Shook some hands and then walked away from the other runners. He was alone. He looked around briefly as if he was looking for someone specific or a group in a certain section of the Coliseum. He seemed so intense. I remember that whatever or whoever he was looking for he found. He raised both his arms. He was pointing at someone. His eyes locked on a target. He roared something from deep within him, from his gut and his soul and his heart all at once. I remember people in the family room asking questions. I hear people ask it now as they watch the race so many years later. I knew he wasn’t mad. I knew he was looking up at those guys in the Press Box. He was looking up at them as they sat in front of their typewriters and smoky ashtrays. He was looking up at all of those that typed the words “washed up”, “soft”, “old”, “unfit”, “pampered” over the last two years. He was looking up at them from the oval, the finish line, the battlefield. I didn’t know what he said exactly. I still don’t. I don’t want to know. I know why he said it though. I knew he had read what they wrote and heard what they had said. They didn’t believe – not in his recovery from sickness or his training or his tactics. They didn’t believe in Seb Coe. And I know he believed in himself when they didn’t. He believed during those cruel comeback races and those less than stellar interval workouts and those breakfasts reading the morning paper shouting headlines that said he did not belong. Not them. They were up there. He was down on the track. And down with Seb is where the story is lived and breathed and raced and lost and won. Up there is where the story is typed. We all have our own British press that we have to battle during our lives. People will tell you where you failed and where you came up short – people who often have never taken a starting line or made it to a finish line or ever had to stand up and deliver or face the wall. Sometimes we are our own British press. We doubt ourselves. We beat ourselves up. We call ourselves names. We tell ourselves to shut up when we want to open up. We tell ourselves we don’t deserve to try. We tear ourselves down and we tear ourselves away from where we want to be. But we all have within us the same stuff that Seb Coe had. That stuff is what battles the demons. That’s the part of us that actually puts those toes to the line and waits nervously-confidently for the gun. That tells us we can in fact begin. The part of us that believes to the end, even when everyone else has left and gone. I was 8. It was 1984. I was sitting so close to that TV. I watched Seb Coe in the Olympics. I watched Seb Coe battle. I watched Seb Coe cross the line. I watched Seb Coe stand there all alone. I had just learned my first lesson on what you need to be a stronger runner, a stronger person. I learned that sometimes you’ll find yourself all alone there at the end. You’ll be alone with the one person who believed in you – you. I learned sometimes being alone means you won.